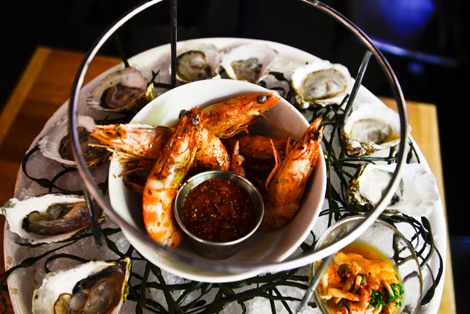 Seafood towers are the ultimate way to celebrate a lavish summer. Here's our animated guide to the city's best. Ordering a towering, three-tiered plateau loaded with seafood to your table is the ultimate way to assert your presence in a dining room. 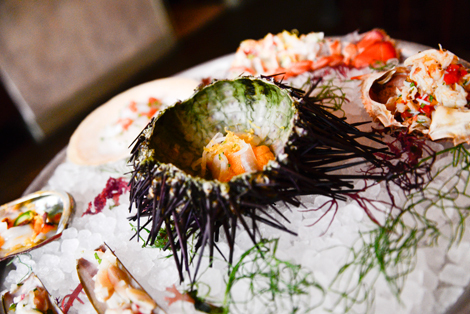 Plateau de fruits de mer, seafood towers, shellfish platters, or whatever you choose to call them are the ultimate “look at me” dish—when there’s one in front of you, covered in bivalves and crustaceans, everyone in the restaurant sees that you’re shining. If we had our way, “I Am a God” would automatically take over the speakers whenever ours hit the table. 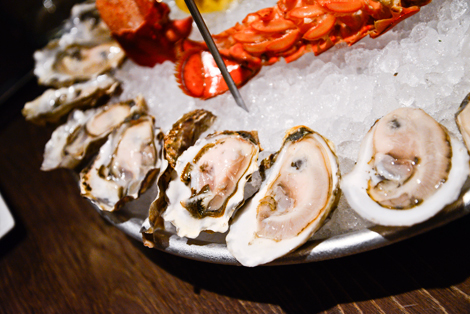 As the name suggests, plateau des fruits de mer got its start in France. While the tradition of ornate arrangements of food dates back to the bored aristocrats of the 17th century, les plateaus truly took hold in the bustling brasseries of 1920’s Paris. La Coupole on Boulevard Montparnasse had a version of the regal menu item, as did neighboring seafood-centric restaurants Le Dôme and Le Sélect. To this day, seafood towers mark the tables of great restaurants not just in Paris, but all over the globe. Needless to say, they’re not cheap, so you want to make sure you get the real deal when you decide to blow a cool stack on a raw-bar glory. We tracked down NYC’s five most stunning seafood towers, and to show you exactly the type of pomp you can expect for your money, we made some animated GIFs of the construction process. Click through the slide show to see chefs and their staffs build the most awe-inspiring towers this city has to offer. Website: arlingtonclubny.com The lowdown: The plateau at this Laurent Tourondel's new steak-and-sushi joint lives up to its address in sumptuousness, but stays at sea level (i.e., no stacking) to remain dignified among the Brahmins of the Upper East Side. 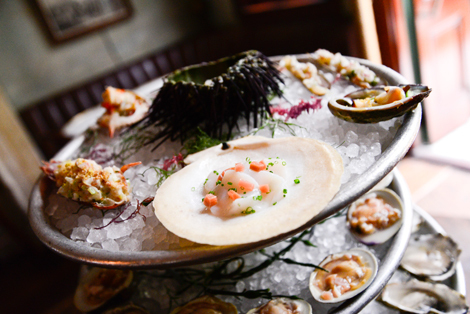 The gorgeous platter is comprised of Kumamoto and Kusshi oysters, Littleneck clams, shrimp, crab, mussels, lobster, scallops, and ceviche. House-made cocktail sauce and pink-peppercorn mignonette are served on the side. Price: $85-$145 Address and phone: 131 Sullivan Street (212-677-6200) Website: thedutchnyc.com The lowdown: Chef Andrew Carmellini&apos;s boisterous Soho oyster bar and restaurant serves both a conservative "Sullivan Platter" and a more grandiose "Prince Platter" (no prizes for guessing which one you should order—life&apos;s too short for baby towers). 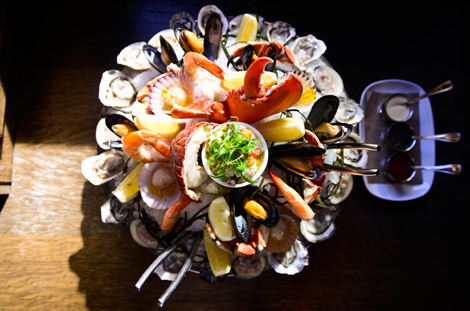 The magnificent Prince plateau includes a bevy of bivalves, fish, and crustaceans, including the following: oysters, Littleneck clams, hamachi, Jonah crab claws, trout roe, sweet shrimp with red remoulade, and lobster cocktail. No wonder Aziz Ansari likes this place—it&apos;s the ultimate "treat yo&apos; self" spot. Price: $185 Address and phone: 298 Bedford Ave, Williamsburg, Brooklyn (347-335-0446) Website: maisonpremiere.com The lowdown: At this New Orleans-inspired den of absinthe and oysters, the "Le Grande Maison" plateau is a wild one. 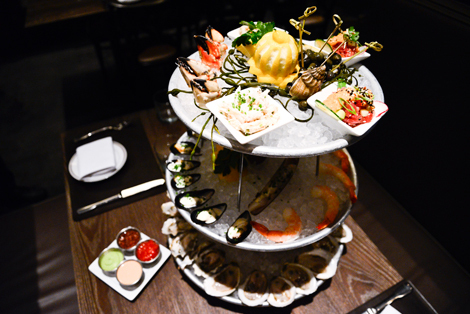 The three-tiered tower includes sweet sea urchin garnished with daikon and ginger; razor clams with mint and radish; scallops with pickled rhubarb and horseradish ice; abalone with grapefruit and sorrel; crab with peppers and rouille; Canadian oysters topped with caviar, Cherrystone, Littleneck, and Top Neck clams; and lobster with tarragon and lobster mayo. Maison has got you covered in the condiment department—the plateau is served with lemons, horseradish, cocktail sauce, and mignonette. Work your way through it while sipping some of city&apos;s best juleps and Sazeracs. Price: $195 Address and phone: 1196 Broadway (212-792-9000) Website: thejohndory.com The lowdown: When chef April Bloomfield does seafood, you better believe she does it right. Bloomfield&apos;s plateau for six, served at her excellent oyster bar in The Ace Hotel, is the stuff of Instagram dreams, stacked high with 18 East and West coast oysters; 12 Littleneck clams; six whelks (sea snails from the Atlantic); six prawns; a half Dungeness crab; and a whole lobster split in half and dressed with herbs. Six insanely good Parker House rolls are served on the side—but let&apos;s be honest, who needs bread when you have mountains of seafood at your table? Price: Petit $37, Grand $69, Royale $95 (without beer) Address and phone: 299 Bowery (212-933-5300) Website: dbgb.com The lowdown: If you’re a beer nerd with an expense account, Daniel Boulud&apos;s haute-sausage joint is the place to be this summer: Every Friday from 1pm—6pm through August 30th, DBGB’s Fruits de Mers Plateau comes with two carafes of beer. 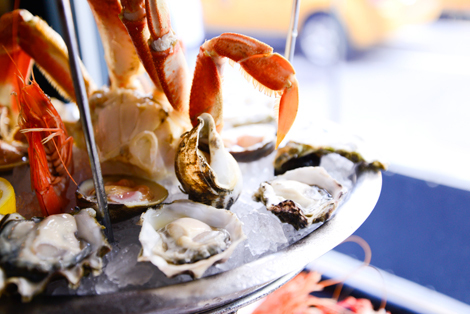 Step one: Order any size tower (Petit $55, Grand $85, Royal $115; with beer)—all three are loaded with East and West Coast oysters, lobster tails, whelks, and periwinkles. Step two: Choose between top-notch brews like Left Hand Milk Stout, Reissdorf Kolsch, Bronx Pale Ale, Peak Organic Summer Session, Flying Dog Underdog Lager, or Founder’s Reds Rye to go with your plateau. Step three: Eat, drink, and be merry. All photos and GIFs by Liz Barclay (@liz_barclay) Ordering a towering, three-tiered plateau loaded with seafood to your table is the ultimate way to assert your presence in a dining room. 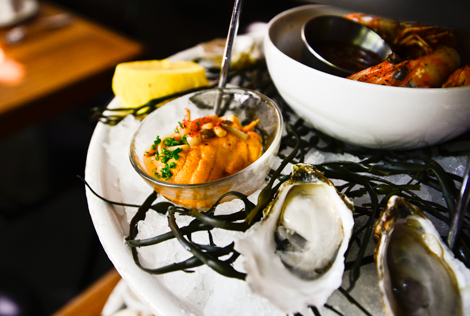 Plateau de fruits de mer, seafood towers, shellfish platters, or whatever you choose to call them are the ultimate “look at me” dish—when there’s one in front of you, covered in bivalves and crustaceans, everyone in the restaurant sees that you're shining. If we had our way, "I Am a God" would automatically take over the speakers whenever ours hit the table. 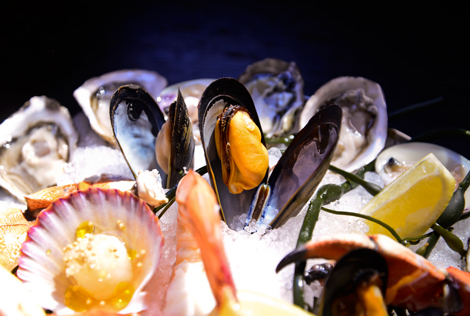 As the name suggests, plateau des fruits de mer got its start in France. While the tradition of ornate arrangements of food dates back to the bored aristocrats of the 17th century, les plateaus truly took hold in the bustling brasseries of 1920’s Paris. La Coupole on Boulevard Montparnasse had a version of the regal menu item, as did neighboring seafood-centric restaurants Le Dôme and Le Sélect. To this day, seafood towers mark the tables of great restaurants not just in Paris, but all over the globe. Needless to say, they're not cheap, so you want to make sure you get the real deal when you decide to blow a cool stack on a raw-bar glory. 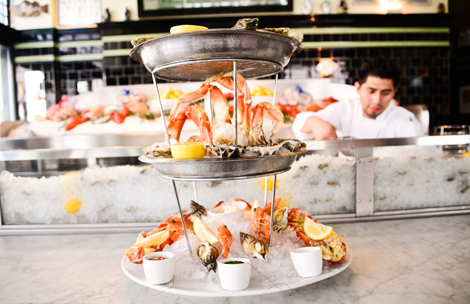 We tracked down NYC’s five most stunning seafood towers, and to show you exactly the type of pomp you can expect for your money, we made some animated GIFs of the construction process. Click through the slide show to see chefs and their staffs build the most awe-inspiring towers this city has to offer.